Pause and prioritize what is most important to you. Are there activities or obligations that can you can pass on this year? Can your holidays be scaled down a little to give you the time for self-care that you need? Trust me, none of these things will happen naturally. You must think about them and choose where you will invest your time, your energy, and your stress. Stay hydrated. Eat before you go to parties so you won’t be tempted to nibble on those sweet or salty snacks that may irritate your tongue and mouth. Keep the alcohol to a minimum, and pay attention when your doctor says not to mix it with particular meds you may be on. Impairment can sneak up on you and a car accident is no way to celebrate the holidays. Make sure you are getting enough rest and if an opportunity to nap comes your way, take it! 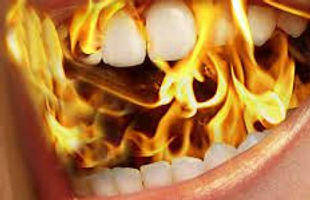 Check out the Burning Mouth Syndrome (BMS) Group on Facebook and the Burning Mouth Support website for more coping strategies, and remember, it is nearly impossible to care for others if you are not taking care of yourself.